A Jeroboam of Veuve Clicquot NV Champagne (3 litres). This is presented in a branded wooden gift box and is lined with wood wool. Personalize this gift by adding your own personal message. 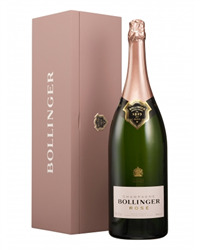 Send a Jeroboam of Champagne, pouring 24 glasses each it's the perfect gift for a celebration. 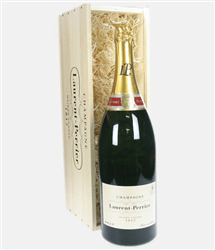 Our range of Jeroboam of Champagne gift - 3 litre bottle includes Champagnes from Laurent Perrier, Lanson, Moet, Veuve Clicquot and Pol Roger. Order online or by phone and we will deliver to the address of your choice, beautifully packaged in its own wooden presentation box. 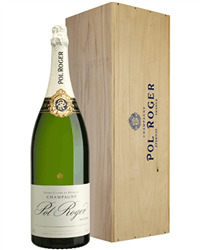 What is a Jeroboam of Champagne? 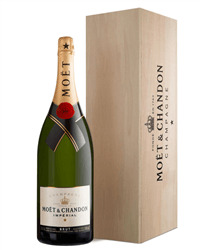 A Jeroboam of Champagne is a Champagne bottle which contains 3 litres of Champagne. How many bottles of Champagne are there in a Jeroboam? A Jeroboam of Champagne is equal to 4 standard Champagne bottles. What is bigger than a Jeroboam? 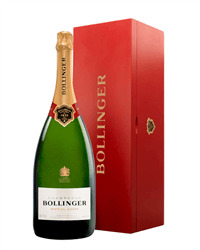 The next Champagne bottle size up from a Jeroboam is called a Methuselah which is equal to 6 standard Champagne bottles. What is a double magnum called? In Champagne and Burgundy the 3 litre bottle is called a Jeroboam. In Bordeaux this size is called a double magnum. How many litres are in a Jeroboam? A jeroboam holds 3 litres equal to 4 standard bottles.